Unleash your creativity with the flexible tripod - the ultimate flexible smartphone tripod. Crafted with textured neo-rubber legs for superior gripping power so you can mount and secure your phone to just about anything. The flexible tripod is incredibly strong yet lightweight and compact making it the perfect companion for capturing photos and videos. 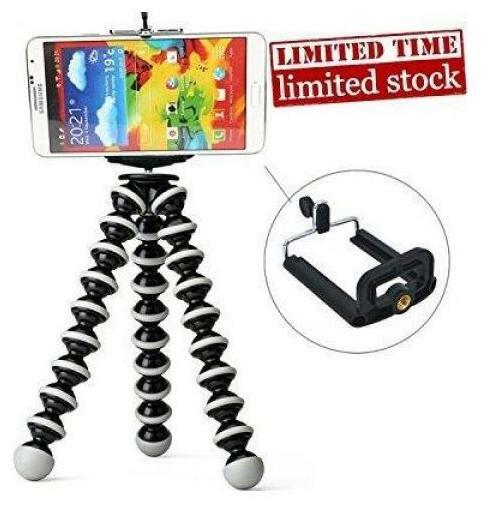 The flexible tripod allows for infinite variety when positioning your phone for unique camera angles so you can capture impossible shots with ease. Specifications: materials: ABS plastic, rubber -dimensions: 10 x 2 x 2 inch -weight: 155g -max.load: 1 kg packing list : -1 x flexible tripod -1 x phone mount adapter -1 x carrying bag features: the materials used in making the tripod include ABS, tpe, pom, rubber, ABS+PC and stainless steel. -the legs can not be broken, regardless of the sequence and the tripod can be attached to the leg for some degree of tension. -the angles of the adjustable spherical heads are adjusted by simply turning the locking knob of the device hence allowing the smartphones to adjust to the correct angle. -the 1/4 universal screw camera is easily connected and attached directly to the digital camera without mirror and the panoramic camera 360. -all type of camera and phone can also be used with the phone holder and adapter.